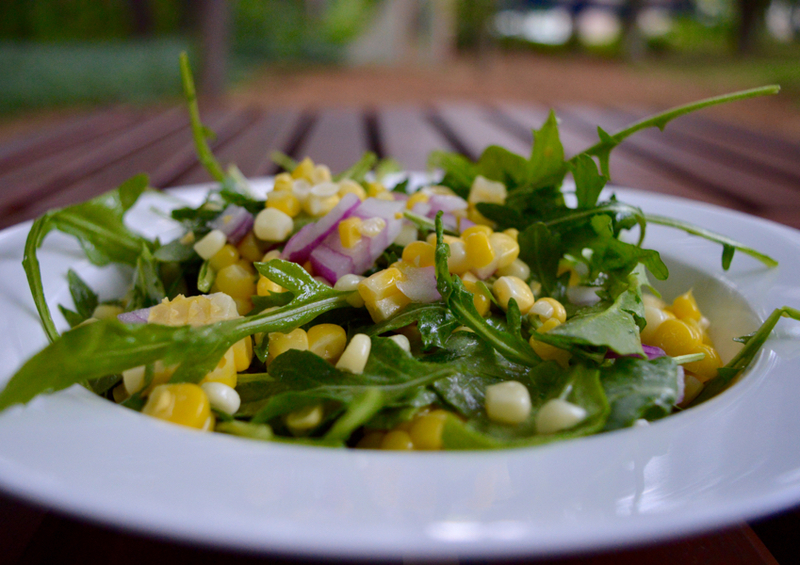 Definitely one of my all-time favorite summer salads! I use it as a side dish, snack, with shrimp for a complete meal or mixed in with pasta and sprinkle of parm. 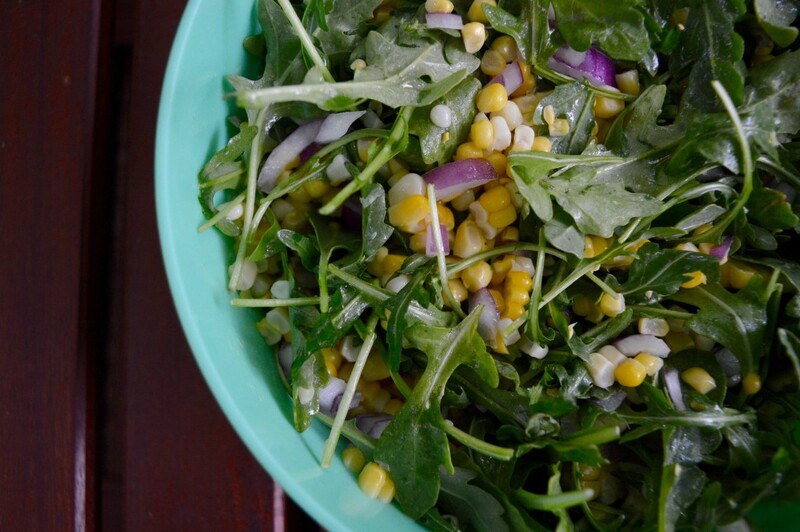 Inspired by a recipe found at Whole Foods, it's one salad you must try. Pretty much every single day of my life, I go to my local Whole Foods to get something. Whatever that may be, I never really know until I step foot in the door. I think it's funny considering I practically spend half my paycheck on groceries every week, run a cooking blog and make every single meal I eat, but I get bored easily with things and need new inspiration - so thank god for Whole Foods. The prepared foods aisle is loaded with inspiration, which is where I came up with this gorgeous salad. Simple, fresh, easy to make and totally delicious. 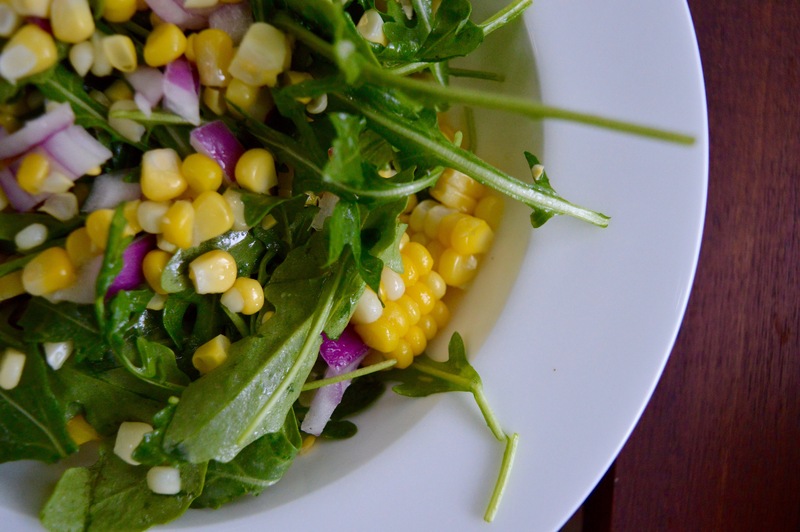 Of course in the summer sweet corn is a must-have. So sweet you could eat it raw. 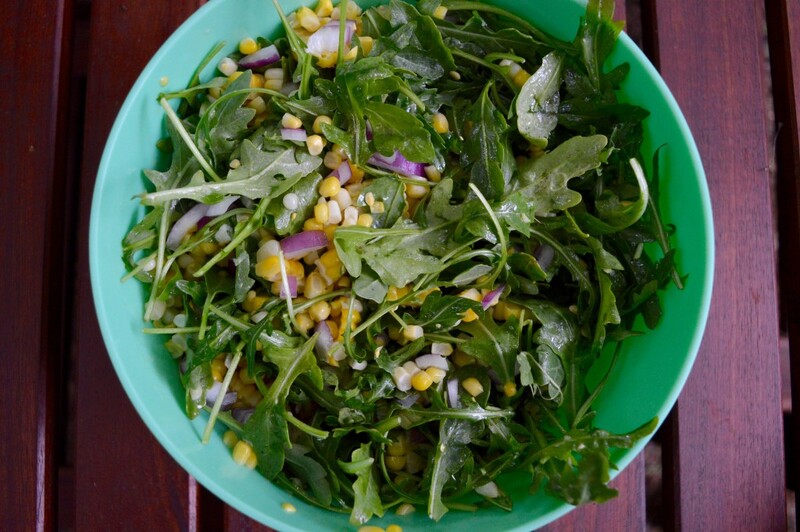 The arugula gives the salad a fresh and peppery taste and of course lettuces are growing like weeds these days, so you know the arugula is fresh! I make a big batch of it and portion it out as I go through my week. It can last in the fridge well for up to three days. I've used it for just about everything, although my favorite is to just eat it as is, as a snack mid-afternoon. For dinner that night I cooked up some shrimp in coconut oil, salt, pepper and a little cajun and topped the salad with that. It's a versatile salad perfect for anything and everyone. Enjoy! Cook the ears of corn in the microwave for 5-6 minutes each, then while running them under cold water, remove the husks. Dry the corn and then cut the kernals off and place in a large bowl. Add remaining ingredients, stir to combine and enjoy! I love this salad from Whole Foods! Didn’t the dressing have some white wine vinegar in it? It might have vinegar in it and I’m sure it would be delicious! 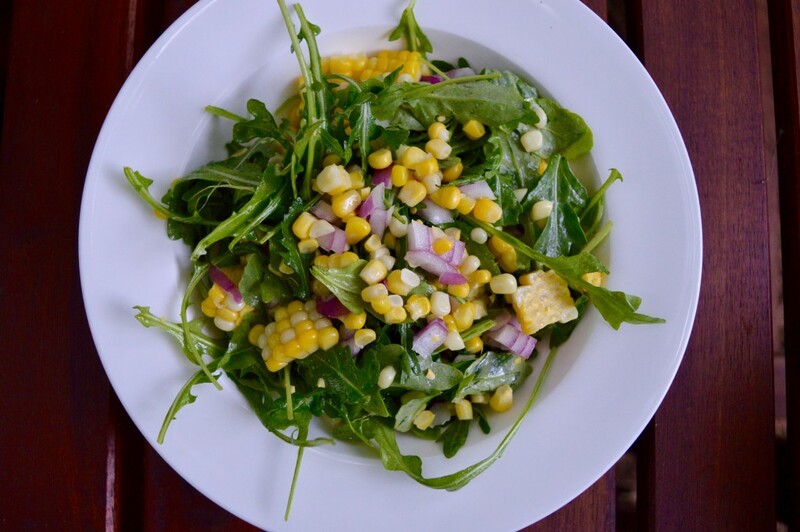 I just made it as simple as possible to keep the flavors of the corn and arugula number one, but next time I’ll add a bit of it and try it out 🙂 Thanks so much for visiting the site! Thank you! My families love this dish!! Thank you so much Nguyen!